It's an interesting chain of observations but on balance I don't think it's as compelling as the evidence pointing further west. First, the Queen Elizabeth Forest Park is a pretty big area with a wide variety of soil types. Next time I'm in the Peter Watson Building I'll try to remember to look at the big maps of Scotland they have detailing the soil types for just about every square yard and maybe take a picture, but basically the park is anything but homogeneous. The area their tests pointed to was actually the east slopes of The Cobbler as far as I recall [*] and they did search there and they did find a body but of a missing hillwalker, not Suzanne Pilley. The finding of that body shows something interesting. That woman had met with an accident. She died out in the open of natural causes. Nobody tried to conceal her body. And yet it was something like two years before she was found, and then only because of the search for Suzanne and the earth on Gilroy's car leading the police to that general area that she was discovered. Which just goes to show that bodies can lie in that terrain for a long time before being found accidentally. Twenty minutes isn't much in a journey like that. I struggle to believe that Gilroy would have managed to dispose of the body in such a short time period, indeed that he would have done so when he actually had a lot more time than that at his disposal. To race up a forest track, drive his car off-road, dump the body hurriedly and cover it roughly with vegetation, then turn around and scarper without hanging around to do a better job of it? Also, to do that so far east, in a relatively well-frequented area of Perthshire, when he was headed into the wilds of Argyll? It doesn't make a lot of sense. Another point. The broken suspension was said to have made his car "virtually undriveable". This raises the question of when did that actually happen and how did he manage to drive it afterwards. This is actually a point that causes some problems with any version of the story including the police one, but it's particularly problematic with a version in which the off-road driving and presumably the damage occur as early as one o'clock. If he did dump the body as early as that, losing only about 20 minutes in his journey, why did it take him so long to get to Lochgilphead? Why the missing hour and a half or whatever between Tyndrum and Inveraray? Surely if he'd succeeded in losing Suzanne that quickly and that early, his priority would be to get to Lochgilphead as early as possible so as to make it as difficult as possible for anyone to point the finger and say, that journey took too long. And he wasn't limping along with crashed suspension at that point because he did the distance from Inveraray to Lochgilphead in almost exactly the expected time for that journey. Then again, if he didn't go back to do a better job on the concealment on the return journey - and he didn't go back via Lochearnhead as far as we know, he seems to have gone back over the Rest and Be Thankful - why all the lost time on the way back? By your theory he managed the entire job in a time window not much more than might be caused by getting stuck behind a caravan for a long stretch, and then wasted two sizeable and hugely suspicious time windows later in the journey in places nowhere near where the body was left. As regards the broken suspension, I'm of the opinion it must have happened on the return journey, in view of the normal journey time from Inveraray to Lochgilphead. I suspect he either still had the body in the car when he called at the school (though in that case what was he doing in the missing time window between Tyndrum and Inveraray on the outward journey? ), or he decided to go back on the return journey and make a better job of it, and ditched the car while he was doing that. 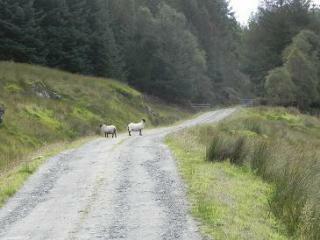 He didn't go back by Lochearnhead/Strathyre. [*] ETA: Sorry I see what you mean, I'm getting mixed up. The Cobbler isn't in the Queen Elizabeth Forest Park, it's west of Loch Lomond and not that far from where the phone pings were recorded. As you were on that point. Last edited by Rolfe; 27th August 2016 at 02:25 PM. Jings, I wish I could persuade you to give grid references instead of these latitude/longitude co-ordinates. But I think I see the roads you mean. The OS map is pretty detailed and you can see a lot. Mainly the east side of Strathyre is very steep and all forestry plantation. You can get a huge amount of detail on the terrain from the aerial view, indeed I can see individual felled trees lying just off the first of the roads you mention. There's also the Google Streetview which gives a different angle and can be useful even though the actual Google maps are a waste of time. The main difficulties are population and time. The A84 through Strathyre is very busy, at least compared to the Argyll countryside further west, and he'd be taking an enormous risk of being seen, trying to dump a body there in the early afternoon in May. But mainly we're back to not understanding the reason for the two hugely suspicious unexplained time gaps later in the day when he was nowhere near Strathyre, and which would have been madness if he had already got rid of the body in a near-miraculous 20 minutes and was in a position to complete his errand to the school in the expected time and say, who me? I went pretty much straight there and back. Think about it. The total time for this exercise, including both driving the detour and dumping the body, is 25 minutes at the absolute outside. Ten minutes is nothing as regards getting away from the main road to a remote spot. Another ten minutes back, and he only has five minutes to get a strapping lass out of the boot of his car and conceal her somewhere out of sight. And that’s not allowing any time for scouting around to find a suitable place. I don’t think it’s possible. Also, it's very difficult to conclude other than that the damage to the suspension happened on the way back. When he was nowhere near Strathyre. 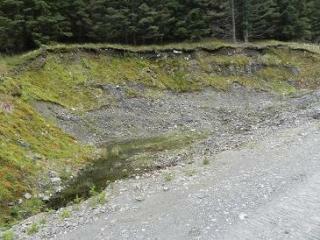 So if the soil was picked up when the suspension was damaged, then it can't have been from Strathyre. I started off by favouring Glen Aray for this whole mess. It has forestry tracks very similar to the ones you're looking at in Strathyre, and it's in the right area for the missing time on the outward journey. But even though it's a lot more remote than Strathyre, when you look on Streetview most of the plantations are gated off so it wouldn't necessarily have been all that simple. And again, he didn't go back by Glen Aray and something happened on the way back. Two possibilities. Either he doubled back after passing the Green Welly, went all the way back to Crianlarich, down the north section of the Loch Lomondside road to Arrochar, and footered around there for some time before going on to Inveraray; or he went straight to Inveraray but turned north rather than south when he hit the A83 (which wouldn't have taken him past the CCTV camera) and went to the Rest and Be Thankful area that way, footered around a bit as before, then back to Inveraray the same way but continuing on the A83 this time and being caught by the camera south of the junction. The latter route is longer but even allowing for driving time it still gives him about an hour to hide the body, and it does fit with there being no report of his car being seen on the Green Welly CCTV a second time as he doubled back. There is also the information that he was familiar with the area (between Arrochar and Loch Awe) from childhood holidays and I think he'd been hillwalking in the area. And it's also extremely steep and criss-crossed by forestry tracks in just the same way as the other areas mentioned. And the clincher for me is that this seems to have been the way he went home. Past the Rest and Be Thankful to Tarbet, down the south half of the Loch Lomondside road to Balloch and left on to the A811 to Drymen and back. That takes him back into the Rest and Be Thankful area, not to Glen Aray or Strathyre. I think that's when the damage to the suspension happened, not in the early part of the journey. So I’ve come round to thinking the cops were essentially right, it’s just that the reporters didn’t explain his proposed route very well in the press articles. I think he set off for Lochgilphead by his usual route, possibly imagining he could dump the body along the way, maybe even in Glen Aray, but at some point - probably after passing Tyndrum - he remembered what he knew about the Rest and Be Thankful area and decided that was the place to aim for. Maybe he was nearly at Inveraray before he thought of it. Maybe he had scouted a few places already to no avail. So, kicking himself for not taking the Balloch-Arrochar route to Lochgilphead in the first place, he headed north towards Glen Kinglas to sneak up on it from behind. He has about an hour to spare there, to get off the road and conceal the body and get back again. I think the body can’t be found because it’s really wild and steep and there’s just so much territory in the frame. Glen Croe, Glen Kinglas (less likely), Glen More and Hell’s Glen. I think he realised that time was getting on, maybe it took him longer than he anticipated to find a really good spot, and he upped sticks and went on to Lochgilphead still unsatisfied with the concealment job. Maybe again he’s kicking himself for doubling back at all at that time, rather than carrying straight on to the school with the body in the car and doing the job on the way back when he can simply take that route home without taking the loop north to Tyndrum. So he gets to the school but by this time he’s unfeasibly late and only meets the cleaners but gets some bin bags and cable ties. He heads back by the Arrochar route, going back on the way to wherever he left the body and completes the concealment to his satisfaction. Wherever he dumped the body, that’s about as good an approximation to his actual movements as we’ll get. None of it makes sense if he dumped the body in Strathyre at one o’clock. He did go through Strathyre though. Did he go off-road somewhere there and get some vegetation on the car at that point? Possible, but for all the reasons I’ve outlined I don’t think he dumped the body and I don’t think he ruined his suspension then. How did he wreck the suspension? I’ve been assuming it was done by driving off-road at the same time he got the vegetation on the undercarriage, but that’s not necessarily so. The best way to wreck suspension is by driving on hard, stony, uneven tracks at speed. You won’t necessarily pick up a lot of weeds on your undercarriage doing that. Maybe the vegetation was from Strathyre, from an abortive 20-minute detour when he went through some soft ground, and the earth and grass stuck. But then somewhere around Glen Croe or Hell’s Glen he drove along rutted forestry tracks at a high speed, trying to get to and from his chosen concealment spot as fast as possible. He got away with it the first time but on the way back he overdid it, hit something hard or went into a really deep rut, and broke his suspension. Then he had to limp back to Edinburgh rather more slowly. I think though, unlike Ian Brady, he probably does know where the body is. He didn’t just head out over open moorland at random, he was aiming for somewhere he already knew. And he went back a second time, later in the day. He could find the place again, close enough to give the police a decent chance of finding her bones. I hope he’ll do that before it’s too late for Suzanne’s parents. Incidentally, a friend of mine who is a lawyer was asked to give an opinion on Gilroy's appeal application, by his (Gilroy's) family. I believe he (my friend) declined to get involved. I have begged him to tell me in confidence what he thinks about the case, but my efforts have been met by tight-lipped silence. The soil samples found underneath his car match soil from The Queen Elizabeth Forest so it is possible that he drove over this soil whilst in the Strathyre Forest area in the 21 missing minutes although it is more likely the disposal was made between the Tyndrum to Inveraray route as he did have much more time. Arriving at The Green Welly Stop at 13.23 Gilroy then drove past The Royal Burgh Cafe, Main Street West, Inveraray where his car was caught on camera at 15.51. He switched his phone on at The Royal Burgh Cafe at 15.51 and left it on whilst visiting Lochgilphead. The Inveraray to Lochgilphead High School timings are 15.51 to 16.29, normally takes 33 minutes, he did it in 38 minutes. He switched his phone back off at 18.58 when he passed The Royal Burgh Cafe again. The next CCTV sighting is back at The Green Welly Stop at 21.08.
and kept it on, arriving at Corstorphone Police Station 28 Meadowplace Road Edinburgh at 23.40. This return route is Tyndrum-Ardlui-Tarbet-Balloch-Drymen-M9 back to Edinburgh. You may have to zoom out/zoom in a few times on the map. The above website may not take you to the map depending on which browser you use. the link may not work so use the search bar above this at the top of the search page. which will allow me to post weblinks. Go and post some inane pleasantries somewhere in Community until you have 15 posts or something like that, then you can post links. You have more information than I was able to glean, so this is very interesting. I didn't realise he'd been clocked at the Green Welly on the way back. I thought he'd gone Inveraray-Tarbet through the Rest and be Thankful. It's a very weird route to go all the way up to Tyndrum and then back to Ardlui and I wonder why he did that. It doesn't pass where he's supposed to have stashed the body so if he did stash it there then again he made an inexplicable detour to the location rather than take the obvious route that would have taken him past it anyway. There are three rational routes from Edinburgh to Lochgilphead as far as I can see. None of them involves Ardlui. You can do what the AA says and take the M8 to Glasgow and cross the Erskine Bridge, go up the side of Loch Lomond to Tarbet, then across the Rest and be Thankful to Inveraray and on. But nobody in their right mind would choose to risk the urban M8 and the Kingston Bridge for that journey. So you could cut out Glasgow by going to Stirling and taking the A811 north of the Campsies to Balloch then up the side of Loch Lomond as before. Or you could do what I think Gilroy was in the habit of doing and go up to Crianlarich and Tyndrum and pass well to the north of Loch Lomond. I don't see why anyone would go through Ardlui, it doesn't make sense. I wonder whether he was panicking a bit and driving around without really thinking through what he was doing, or whether he was deliberately trying to confuse anyone trying to find the body by retracing his steps, or what. There's a tension there between time spent driving pointlessly around the scenic countryside, possibly confusing a subsequent investigation (but at the same time looking suspicious and making it difficult to find a sensible explanation for why he did that though having said that he didn't appear to try), and the need for time to accomplish a successful concealment of the body. If he did conceal the body somewhere in the Glen Croe/Hell's Glen area, he could quite easily have taken the direct route from Tarbet to Inveraray and simply ducked down the B828/B839 with his phone off and nobody would have been any the wiser. He could probably have done it and only added about an hour to his journey all told. There's more than enough wild country there to hide a body without wasting time looping up to Tyndrum at all. I don't get it. I also don't follow why he seems to have turned his phone on in the afternoon during the unexplained 2-hour time period when he was apparently travelling between Tyndrum and Inveraray. If it hadn't pinged the Glen Croe mast during that time nobody would have had any particular reason to think he'd gone anywhere near the Rest and Be Thankful. "Gilroy is accused of travelling to an area near Glen Croe Forest, Argyll, or elsewhere in Argyll, after telling colleagues he was travelling to Lochgilpead High School." This charge relates to his Tyndrum (13.23) to Lochgilphead (16.29) journey. This indicates that his afternoon route from Tyndrum (13.23) to Inveraray (15.51) was from Tyndrum on the A82 to the A85 to the A819 to the A83 to Glen Croe area and then back to Inveraray along the A83 then on to Lochgilphead. As his phone was switched off from 12.00 to 15.51 this information could not have been obtained from his phone pinging a mast. The information in the indictment must have came from eyewitness(es) although there are no reports about witnesses giving specific information. "Gilroy allegedly went to an area near to Ben Donich, Argyll, on May 5 when he had been asked to come immediately to Corstorphine police station." This charge relates to his Inveraray (18.58) to Edinburgh (23.40) journey. His evening route from Inveraray (18.58) to Edinburgh (23.40) also involved passing Tyndrum (21.08) and Ardlui (21.34). The route he must have took going from Inveraray was on to the A83 to the B828 to Ben Donich area then back on the A83 east to the A819 to the A85 to the A82 at Tyndrum then continue on the A82 to Ardlui via Crianlarich. His phone was switched off until 21.34. Again the information in the indictment must have came from eyewitness(es) although there are no reports about witnesses giving specific information. The sensible route to take upon finishing whatever he was doing near Ben Donich would be to return to the A83 at The Rest And Be Thankful viewpoint and then go east on to Arrochar to Tarbet and go south on the A82. But instead of going east and taking the short route to Tarbet to join the A82. Back in the direction of Inveraray on the A83 then back up the A819 then on to the A85 to Tyndrum then on to the A82 to Crianlarich then Ardlui then Tarbet. The short route from The Rest And Be Thankful viewpoint to Tarbet is 8.2 miles and takes 14 minutes. The long route (which he took) from Rest And Be Thankful viewpoint to Tarbet is 63.9 miles and takes 90 minutes. to Tarbet or something interested him in the areas which passed the roads on the long route, it must have been important to him to drive this massive diversion. It seems the indictments are based on witness information, don't know if this is good or bad information, whether it relates to his car and/or to him. But it was enough for the police to carry out large scale searches of the Glen Croe/Ben Donich areas. and then back to Inveraray along the A83 then on to Lochgilphead. As his phone was switched off from about 12.00 to 15.51 this information could not have been obtained from his phone pinging a mast. to the A85 to A82 at Tyndrum then continue on the A82 to Ardlui via Crianlarich. and then go east on to Arrochar to Tarbet and go south on the A82. The long route (which he took) from Rest And Be Thankful viewpoint toTarbet is 63.9 miles and takes 90 minutes. It seems the indictments are based on witness information, don't know if this is good or bad information, whether it relates to his car or to him. But it was enough for the police to carry out searches of the Glen Croe/Ben Donich areas. Seem to have copied in the last entry twice, sorry. You can edit your posts if you notice a boo-boo within two hours by the way. I never saw the indictment, that's very interesting. It's quite frustrating how poorly a lot of this is reported and how confusing it can get taking the "facts" from the Daily bloody Retard. One constant problem was them going on about the road from Tyndrum to Inveraray going along the shores of Loch Awe - which it demonstrably doesn't. I definitely read somewhere about his phone pinging a mast at Glen Croe though. If that's not true I wonder where the reporter got it from. I'd be wary of eye-witness testimony, because anyone can see a grey or silver car or whatever it was, unless they made a note of the number how can they be sure it was him? The only reference to an eye-witness sighting I remember was on the Drymen road in the evening. He was in the habit of driving to Lochgilphead. There are a limited number of roads you can take, given the large lumps of geography in the way. You have to make certain decisions about route - north or south of Loch Lomond is the main one, also north or south of the Campsies if you go south of Loch Lomond. Once you're committed to one route it makes no sense to cross between them. In particular the stretch of road between Tarbet and Crianlarich is singularly pointless. I agree with you he knew these roads. He'd have had them in his head. He wouldn't simply have taken a wrong turning by mistake. What the hell was he playing at? I need to study these times and routes you've listed in a bit more detail. Have you any thoughts yourself about what he was up to? I can see why Hell's Glen looks like a splendid place to ditch a body, but it's so close to a perfectly reasonable route from Edinburgh to Lochgilphead, why would he waste time and make himself look so conspicuously suspicious by zooming all over the map? And when did he break the car's suspension and how fast was he able to drive it after that happened? "Gilroy allegedly switched off his mobile phone on May 5 between 12pm and 3.57pm, and again between 6.54pm and 9.34pm, so that he could not be contacted." during two time slots on May 5, when police think Suzanne's body was disposed of by her killer." "They match a sighting of a silver family car parked on a track in the Glen Croe area on the same day." I would go with the indictment, his phone did not communicate with a mast in the Glen Croe/Ben Donich/Hells Glen area as it was not switched on from Doune (12.00) to Inveraray (15.57) and Inveraray (18.54) to Ardlui (21.34). So the eyewitness(es) report that his car was seen in the Glen Croe/Ben Donich/Hells Glen area must have been specific enough to warrant the search. at Lochgilphead High School, he advised then that "there is something wrong with my car" and that he would "head straight from Lochgilphead to Edinburgh police station"
I also remember reading that the policeman in charge of the search Gary Flannigan said he was convinced Gilroy was in the Glen Croe/Ben Donich/Hells Glen area. Flannigan stated that during the subsequent interviews with Gilroy in Edinburgh he got the impression Gilroy was trying to divert police attention away from the Glen Croe/Ben Donich/Hells Glen area and Flannigan was unconvinced so thats where the search was made. It seems that Gilroy did not want the police to search the Glen Croe/Ben Donich/Hells Glen area and went to great lengths to keep the police search away from that area. He switched his phone off when leaving Inveraray at 18.54 and intriguingly he kept it off until driving south past Ardlui at 21.34. He drove from Inveraray (18.54) to Tyndrum (21.08) where he was caught on camera at The Green Welly at Tyndrum. It is likely he spent some time during the period (18.54 to 21.08 = 2 hours and 14 minutes) in the Glen Croe/Ben Donich/Hells Glen area. When he had finished what he was doing in the Glen Croe/Ben Donich/Hells Glen area he could have turned east to head to Edinburgh via Tarbet on the shortest route home and switched his phone on south of Tarbet but this could raise suspicion that he had just driven past Arrochar to get to Tarbet therefore placing him near the Glen Croe/Ben Donich/Hells Glen area. He switched his phone on at Ardlui and then his phone is being tracked going south towards Tarbet then all the way to Edinburgh past Loch Lomond. So by switching his phone on at Ardlui then his phone is tracked going south he is telling the police that that he drove from Inveraray to Ardlui via Tyndrum, without diverting and going very slowly. Of course this is the route he took but he thinks the police will not consider that he diverted from Inveraray to the Glen Croe/Ben Donich/Hells Glen area and then double back towards Inveraray and on to Tyndrum. He thought that this diversion was so ludicrous that it would not be considered. His elaborate plan backfired though when he was spotted in the Glen Croe/Ben Donich/Hells Glen area and when Flannigan saw through his lies. If I am right about this then the police search was in the correct area but obviously no body was found. But I may be wrong and his unusual trip to the Glen Croe/Ben Donich/Hells Glen area could just be a red herring designed to confuse everyone. Thanks for all that, very interesting. I need to study what you've found in more detail because it's obviously the real deal and contradicts the crap the DR printed. Sorry excuse for journalism. If there were eye-witnesses they must have appeared in court. I don't remember anything about that in any of the court reports I've seen, but then crappy journalism again. I'd dearly love access to the original trial transcripts but they cost a fortune and they're unlikely ever to escape into the wild the way the Lockerbie transcripts did. My feeling all along about this is that Gilroy was acting under the mistaken belief that if the body was never found he could not in law be convicted of murder, therefore it didn't really matter how suspicious the police were of him so long as he was successful in concealing the body. That makes quite a lot of sense in the light of what you're saying. However, I think you're suggesting that he intended to go to Hell's Glen all along but deliberately didn't take the direct route to Lochgilphead that would have almost passed it in order to deflect an investigation. So he goes by the northerly route then ducks back in a way he thinks the police won't figure out. But then he seems to have been spotted and I'd really like to know more about that. If you're right it may even be that he deliberately drove off-road in Strathyre, perhaps thinking he might be seen (but he wasn't), but getting vegetation and earth on his car at that time. I can see the argument that he might have got rid of the body there very early and then the rest was misdirection, but I really don't think 20 to 25 minutes is long enough to do anything like an effective job and the danger of a body being found by sheer accident round there would have been quite high. So if he did do anything in Strathyre then I think it was more misdirection, and an attempt to make the search area so wide the police wouldn't be able to cope. So, he takes the sensible northerly route on the way out, but vanishes for over two hours and in that period he doubles back to the Glen Croe area which he would have passed anyway if he'd taken the southerly route. If he said something about his car being damaged when he was at Lochgilphead then presumably the damage was done on the way out. It makes me wonder how he coped with all that driving afterwards when the car was described as being "almost undriveable" but maybe he made it even worse by pressing on. Then he returns, again initially by the notherly route and passes Tyndrum again. But instead of doing the sensible thing and heading east from Crianlarich he goes south to Ardlui and the Loch Lomondside road. By this fairly substantial detour he eventually ends up on the southerly route at Balloch and back to Edinburgh via Drymen. And again by doing this he passes fairly close to Glen Croe - but yet the route still wouldn't have taken him actually in there and across the Rest and Be Thankful. If he lost a lot more time though it does seem likely that he planned all along to duck back to Glen Croe or Hell's Glen once again. I initially thought the ducking back on that occasion had been from the Tarbet side, but on re-reading your post it seems he repeated what he'd done on the way out and went straight on after passing Inveraray. But instead of simply heading back to Edinburgh via Arrochar and Tarbet he doubled back to Inveraray again and up through Tyndrum. But then, instead of heading east from Crianlarich which is the obvious way back to Edinburgh and the way he'd come (through Strathyre) he turned south at Crianlarich and took the Loch Lomondside road through Tarbet thus bringing him again close to the Clen Croe road. (Why? That bit doesn't make any sense.) What a convoluted plan! But it did succeed to some extent because the papers were full of how the area where the body could potentially have been hidden was absolutely enormous. And yet he didn't, because despite avoiding routes that actually went along Glen Croe, the cops did catch on and that area was the focus of the searches. And yet they never found her. Hmmm. It's so hard to know how much of what he did was bluff and double bluff. I must read more to figure out just how much hard evidence the cops had placing him in Glen Croe, and how much was just natural gut instinct founded on the fact that Hell's Glen seems pretty much to have an Ordnance Survey pin in it with a fluorescent label saying "best place in Scotland to hide a body." Last edited by Rolfe; 29th August 2016 at 05:58 AM. I wonder what the weather was like that day? I had the week off work and I was doing quite a bit of leafleting for the election which was the day after the events we're talking about, but I don't remember that specific day. I think it was quite nice, I don't remember moaning about being hindered by bad weather on eve of poll, but I really couldn't say for sure. I wonder how familiar he actually was with the detailed terrain in Glen Croe and Hell's Glen? It's one thing thinking, that area is pretty deserted and wooded and steep and there must be somewhere to hide a body, but actually fixing on a specific spot is a different matter. If he did happen to know of a hole or something like that, and was able to find it without too much trouble, it would have made it a lot easier. I mean it is remote and sparsely populated and the terrain looks as if there must be loads of possibilities, but even so you can't just roll the body into a ditch and hope for the best. I wonder how he was able to handle Suzanne's body. From the photos she wasn't a waif, she looked to be over ten stones anyway, possibly pushing eleven. That's some dead weight to heave around. If he was able to dismember her it would have made it easier but that would take time in itself, risk being discovered literally red-handed if he was anywhere near the road, and then multiply the time required by necessitating multiple journeys to stash each part. I wonder why he seems to have needed to go back with bin bags. I'm not doing this because I have any thoughts of getting further than the police did, but the whole thing intrigues me in a murder mystery sort of way and I at least want to know what the actual facts are as opposed to the dreck some lazy DR reporter was writing in the paper. But having said that, I wonder if the police considered Glen Aray at all? That was the area I first fixed on, but I abandoned the idea when it seemed he'd spent the missing time in the Glen Croe area rather than Glen Aray, noted that Hell's Glen was a much better body-stashing place than Glen Aray, and was under the impression that he'd returned by Rest and Be Thankful not Tyndrum. However as you're saying he did go back by Tyndrum and moreover the 2½ hour gap again covers the leg of the journey where he went through Glen Aray, well, I wonders. Last edited by Rolfe; 29th August 2016 at 06:25 AM. Nice to see you again, Rolfe. I found some information about the weather on Wednesday 5th May 2010. Could only get details for Glasgow and it was a sunny day (no rain) with an average temperature of 17 degrees. Sunrise was 05.25 and sunset was 21.03. Also some information about the black bags is contained in one of the charges. "While at the school in Lochgilphead on May 5, Gilroy allegedly asked an Elspeth Campbell for a quantity of bin bags and was given the bags." So I believe he was given the bin bags as he stated to the cleaner "I have got some rubbish to clear from my car" and was given them by cleaner Elspeth. “rubbish from his car which he discarded on the way back to Edinburgh”. The maximum time he could spend in the Hells Glen area is from 19.22 to 20.08, a total of 46 minutes. He needed one hour to get from Hells Glen area to The Green Welly at Tyndrum via Inveraray. He passed The Green Welly Tyndrum at 21.08 and his car was pictured driving north to south. So it is possible that he did dispose of the body in the Hells Glen area as it is within the timeframe. The police think he did a "reccy" of the Hells Glen area in the afternoon and disposed of the body in the evening. Maybe he found a good spot (or was digging a hole) in the afternoon and returned to dispose of the body in the evening. Gilroy killed Suzanne on Tuesday 4th May 2010 at 09.00 and as she has been in Gilroys car boot for over 24 hours (when he gets to Tyndrum) rigor mortis has occurred along with smells and leakages, so it's not going to be an easy disposal. Glen Aray to the west of the A819 is a possible disposal site as he passes it on the way back to get to Tyndrum in the evening. Well, there are a couple of possibilities here. Assuming the police are right about him being in the Hell's Glen area both going and coming, either the trips through Tyndrum were intended as misdirection to lead the police to believe he hadn't been anywhere near the Rest and Be Thankful all day but had chosen the northerly route both times, or the doubling back to the Hell's Glen area was itself a misdirection to encourage them to waste an enormous amount of time searching Hell's Glen when the body was actually a lot nearer his main route. I don't know how to guess which is bluff and which is double bluff. And I don't know why he would deliberately head back towards Tarbet in the evening, with his phone on, very close to the area he's been avoiding being seen in all day, rather than go straight back through Strathyre the way he came. One reason I turned away from the Glen Aray idea was that while the road has forestry tracks leading off it, Streetview shows these to be closed off with gates. Well, I had a look at the most promising part of Hell's Glen and the same thing applies. Lookie here. https://goo.gl/maps/M9DjEGgL1G52 Both sides. Gates. Here's the most detailed map I can access of the most promising part of Hell's Glen (I can get this scale of anywhere you like, if you can't access it). 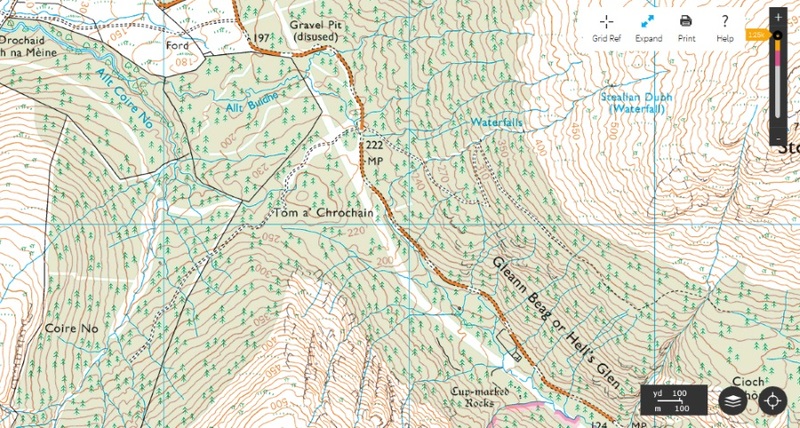 The Streetview co-ordinates in the previous paragraph are the spot on the main road about where the 222m spot height is marked, with a forestry track going off on either side. Either side would probably do, but look at the track to the right. It climbs right up to the 350m contour line with some very steep wooded terrain below it. I wouldn't be at all surprised if that track was in a state that would total the suspension of an ordinary saloon car, especially in early May when repairs following winter water damage are probably not yet done. Get in there and you're well out of sight among the trees. Get up to the high part of that road and you could use gravity to help you manoeuvre a body quite a distance from the track. Find a natural hole or hollow, dig it a bit deeper, and wait for the late spring vegetation growth to do the rest. And the forest scavenger species of course. Even if the police did figure out that she was in that area, the total amount of territory to search is enormous. That suggestion is only one of several possibile off-road routes. Even if the cops figure out from the maps that it's probably the best one, they'd have a hell of a job finding anything in there unless they got lucky. But it all depends on getting past these gates. Are they locked? I'd assume they are, because their primary purpose will be to keep joy-riders and idiot tourists from driving into the plantations and causing damage. Could the police assume Gilroy wouldn't have been able to get past them? The same thing applies in Glen Aray, it's just a lot more open and liable to be overlooked by casual passers-by. Where did he go, I wonder, and what sort of tracks might that car have left? Last edited by Rolfe; 29th August 2016 at 02:53 PM. Did he really speak to a policeman while he was in Lochgilphead? And the policeman knew he was wanted in Edinburgh as a witness in a missing person case? If he was just a witness at that stage, would there have been no risk of the policeman asking to see in his car? I've tried to think what I'd have done in his shoes, but I'm not him so it's singularly pointless. I might have tried to hide the body relatively near Edinburgh during the Tuesday night - and been seen on a CCTV camera. I might have driven more or less straight to Lochgilphead on the outward journey, but scoping out Hell's Glen briefly on the way there and leaving the body temporarily concealed to guard against somehow being rumbled at Lochgilphead and the body discovered. Then I'd have lost the time on the way back while concealing the body properly. Except I'm not strong enough to lift a 10 or 11 stone woman. Presumably he was. I'd have relied on the police not knowing where in that whole area between (roughly) Glen Croe and Ardkinglas to prevent the body being found. I really don't think I'd have gone round by Tyndrum both ways to try to fool the cops into believing I hadn't been near the Rest and Be Thankful. I don't know if I'd have wanted to arrive at Lochgilphead with a body in my car. I think I'd have left my mobile phone lying on my desk rather than this pantomime of turning it on when he wanted to be tracked and turning it off when he didn't. It was quite an assumption really, that he would be tracked through Tyndrum, but wouldn't leave any trace when he doubled back. I'd still like to know what evidence there was of his presence around Glen Croe. It worked, but it didn't work. He was obvious enough to be suspected and charged and convicted, but he did succeed in concealing the body. It's an odd one. I wonder if Gilroy could have been determined enough to break through the gate chain/padlock in the area you suggest with bolt cutters or something similar and I wonder if during the search the police thought "that gate's locked so lets not bother looking here"
The police could have in hindsight have done more, they could have dispatched an officer from Lochgilphead police station to Lochgilphead High School which is 2 minutes drive away. Still trying to find the website which shows Gilroy speaking to a police officer from Edinburgh while in Lochgilphead in the afternoon, and I think it was on scotland judiciary org but all I can find now are sentencing statements. for what you considered to be more than an hour, and you (Gilroy) advised that you would return to Edinburgh immediately, but you failed to do so"
The reason I think Gilroy turned his phone on at Ardlui at 21.34 was to distance himself as much as possible from the Glen Croe/Hells Glen area. His thought process being "the police will be able to track my phone from Ardlui going south so they will think I have just driven from Crianlarich and not driven anywhere near the A83." If Gilroy had switched his phone on at Tarbet instead of Ardlui then the police could assume he had arrived at Tarbet via the A83. It takes a lot of impact to break a spring (unless the springs were in bad condition already) so he would need to be going at speed over very large potholes. There is a cave near Hells Glen called Uamh na Plunderain just off the B839. Honestly, go to Community and make a few pointless posts in one of the threads there. That'll get you to 15 without anyone fussing. I see that, just marked as "cave" on the OS. There's also a Uamph Mhic Eoin Riabhaich just at the entrance to Hell's Glen itself. But I doubt if he'd have put her in a cave, especially one big enough and well-enough known to be marked on a map. Not much vegetation cover inside most caves and the location would tend to preserve the body. Your spot highlights the enormous difficulty of all this though. It's another place where there are forestry tracks snaking through some pretty dense woodland, and there are any number of other such places around the area. If all you have is a general "Hell's Glen/Glen Croe/Ben Donich area" it's a huge area to cover, in much of which you could walk right past a concealed body and not even see it. The tracks into Drumsyniebeg forest seem to be open to the public, but that might actually make them less attractive to Gilroy as there would be more chance of his being discovered at the time, or a dog-walker finding the body later. Although second-guessing this guy may be rash. I wonder what the criteria were for the police search? The broken suspension suggests the car was driven off the public road, probably at speed. 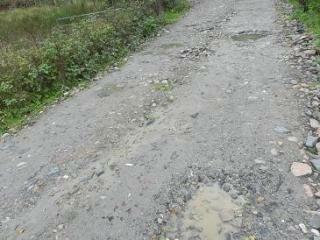 I would reckon rutted and potholed forestry tracks rather than real off-road stuff though, for two reasons. First, if you took a saloon car right off the road there the chances of getting completely stuck would be very high and he couldn't risk it. Second, even if he got away with it the car would probably leave some trace that might persist for some time and be noticed. He wouldn't leave tracks on a forestry track and he'd be unlikely to get completely stuck. So I'd think the area alongside the public road would be low probability. The areas relatively close to the forestry tracks, much higher probability, given that he probably didn't get the car far from a track, if he left it at all, and there's a limit to how far you can manhandle a body in rough country. But what about the gates over the forestry tracks? Are they padlocked or not? I can't honestly tell from the Google image. Also, if the conifers are dense enough there's not much cover under them, so there's a compromise there. He might have tried to break a padlock, but then again he was trying to lose the body without leaving clues as to where to look. A broken padlock might be remembered and reported to the police once the hunt really started. I really would not have liked to be the SIO in this investigation. Last edited by Rolfe; 1st September 2016 at 02:31 PM. The police and mountain rescue teams searched the Glen Croe area adjacent to the A83 from The Rest And Be Thankful to Ardgarten. If you go to google street view at The Rest and Be Thankful viewpoint and look south in the direction of the old military road there is a gate. 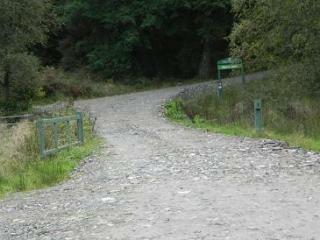 The old military road goes on for 2.3 miles where there is an exit on to the A83 which is also gated. 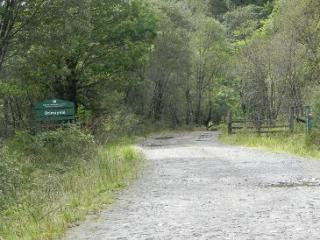 0.3 miles from the junction of the A83 and B828 there is a left turn on to a forest track. So the only vehicular access to Glen Croe is past the Ardgarten visitor/information centre. As Gilroy drove past The Burgh Cafe in Inveraray at 18.58 he would get to the bridge at the visitor centre 26 minutes later at 19.24. Gilroy would have to be back at the bridge at the visitor centre at 20.06 to be able to drive the 62 minutes prior to arriving at Tyndrum at 21.08. So Gilroy has from 19.24 to 20.06 which is 42 minutes to drive from the bridge to the disposal site and dispose of the body then drive back to the bridge. After crossing the bridge there is a right turn which splits into two roads and I cannot see a gate at any of these two roads. There is also a left turn in the direction of the Forest Holidays site. Passing the Forest Holiday site leads to Coilessan. 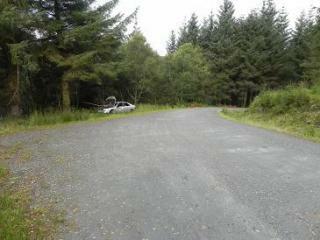 On Saturday 15th August 2010 a search was made of the Glen Croe area by police and mountain rescue search teams. There is a picture taken on geograph.org (photo 2023247) which shows the mountain rescue team at a track which can be reached by turning right at the bridge after the visitor centre. The search suggests Gilroy turned right at the bridge then went west on the forest track adjacent to the A83 for 1.1 miles. Then turn left and drive east for about 1.5 miles to where the geograph picture was taken. The grid square in the picture is NN2603. The track looks to end near where the photo was taken and the photo description says the area of the photo is a "turning circle"
The area where the picture was taken of the four mountain rescue teams meet in the turning circle above Ardgartan on Sunday, 15 August, 2010. Also on geograph.org.uk there is another picture in the area around the old military road, Glen Croe Saturday, 14 August, 2010 near to the A83. This picture also shows mountain rescue and police searching the area. Those locations are all further west than I was looking. The newspaper reports said Hell's Glen but that's really Ardgarten. If he came at it from the west he'd have been almost at Tarbet, relatively speaking, before he dumped the body, having driven past Hell's Glen. I would very much like to know what evidence the police had placing him in that area, if it wasn't a mobile phone signal. Also, what they were going on when deciding where to search. It must all have been presented in court but these useless journalists haven't reported any of it as far as I can see. If the lead was just to the general area of the Arrochar Alps, God help them. It looks hopeless to me. I believe they thought he was heading for somewhere he knew, but that wouldn't necessarily be much use unless they had detailed information about exactly where he'd been when on holiday and that seems unlikely. Another point is that he couldn't have accessed the online maps or the searches would have shown up in his browser history. So unless he had paper maps he'd have been running blind. If he did have paper maps he'd have got rid of them if he'd had any sense. How would he have known which tracks would be accessible and not gated? How many of these gates are locked anyway, and how could he have known? Would the publicly accessible tracks not be a bit too well-frequented for his purpose, and also be less likely to have surfaces so bad they broke his suspension? The gates are a bit of a facer. They make it a lot harder just to drive into the forest any old place, especially if you don't have a very clear plan. But he did go off-road. Do you have any idea where his car was seen parked? If it actually was his car and I wonder how sure they are about that. Those locations are all further west than I was looking. I meant to say east. It does say east if you look really, really hard, doesn't it? Reports mention searches in Glen Croe, Hells Glen and Ben Donich. It seems the police were searching between Tyndrum and Inveraray in May 2010 then Glen Croe and Hells Glen in August 2010. Can't find dates for the Glen Orchy search. The Minard search in 2014 was based on a call to crimestoppers by a member of the public who witnessed Gilroys car whilst Gilroy was driving on the A83 between Lochgilphead High School and Inveraray. But the police knew he drove that route anyway as he had his phone on and he was caught on CCTV arriving at Inveraray. Part of the search would be "intelligence led." This could mean that the police, using their experience and in their opinion, on the balance of probabilities, think that Gilroy went to a certain area and that's where they will look. Mr Flannigan said: "We are confident that we have covered David Gilroy's movements from the moment he left IML on the Wednesday to the point he came to the police station. Clearly we've not looked in the right area or she's not been left there and there is always the possibility that she was placed somewhere else." He added: "There's only one person who knows where Suzanne is, to our knowledge, and that's clearly David Gilroy." Part of the search would be based on telephone calls, either suggestions from the public or actual sightings of Gilroy driving has car or sitting in his car whilst parked or standing near to his car. The police do not mention specific times or places of any sightings in the Glen Croe/ Hells Glen area. The police statements on sightings are vague but they could be designed to be vague because the police did not want to encourage unauthorised searches being made by members of the public as this could destroy any potential evidence. Given that its now over six years since Suzanne went missing and the searches seem to have stopped the police could provide the public with some more information, for example the specific place and time of an actual sighting. This could jog someones memory if they were near that specific place at that time or could encourage more suggestions from the public as to where they think the possible disposal site is. Two heads are better than one ! But maybe the police don't want to go on wild goose chases anymore or let the public think they can't solve this without the public's help. The tracks can be seen in some detail using ordnancesurvey.co.uk and switching to aerial view. I would say that any gate on the track would be locked and I agree that if Gilroy did drive on the tracks it is likely he would pass walkers and cyclists especially in May on a sunny day. Maybe he was willing to take the risk of being spotted by walkers and cyclists in Glen Croe as he was determined to get to the place he knew was ideal for disposing of a body but the sensible thing to do would be to avoid walkers and cyclists and find a more secluded disposal site. I agree that the surfaces of these tracks used by walkers and cyclists shouldn't have caused the suspension damage, he must have been on a forest track which was in extremely bad condition but he drove on it anyway. 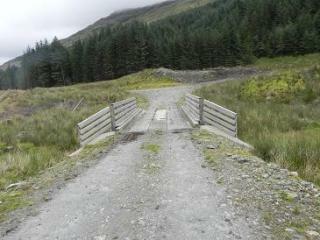 It is on the B839 near Hells Glen and is more secluded than Glen Croe and it looks like its not gated. These roads seem in pretty good condition though. I agree, it's a promising area. I just don't know how you find someone in that area though. There's a huge area to cover and a lot of potential for concealment. Their only hope really is that Gilroy didn't manage to bury her. That would have taken a long time and have been difficult to achieve in such a rocky landscape. But if he managed to get her into some sort of crevice and cover her over, you'd be relying on dogs and the dog would have to be pretty close. I suspect the police did alert the forestry and mining workers in the area to be on the look-out. People who work there are a lot more likely to notice something indicative than general tourists and walkers. I don't know how much point there would be in getting the latter group involved. It could well be one of these cases where the police really did do the best job possible given what they knew, but they simply didn't know enough. far enough and hidden enough from the track not to be seen from the track. The track is 2.4 miles long and it is a huge area to search. I have worked out he would have 68 minutes to go from Pole Cottage to the disposal site, dispose of the body and return to Pole cottage on the afternoon journey. He would have 49 minutes to do the same in the evening. 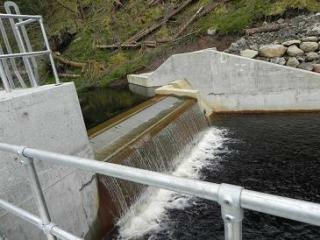 Anyone in the Lochgoilhead area got a few hours to spare ? I'm not nearly close enough I'm afraid. The Pole Cottage track does have some areas of rough terrain. If Gilroy has driven over this terrain in order to get closer to the treeline it may have damaged his cars suspension. Gilroy did not have enough time to dig a deep hole so it is probable he has hidden Suzanne and her belongings in the undergrowth past the treeline. undergrowth which can't be seen from the track by forestry workers, walkers and cyclists. Gilroy wore a black suit with white shirt and tie that day so would not have wanted to get mud and dirt on these as it would have been noticed when he arrived at Lochgilphead High School, so he has not been digging in the mud because of this and the limited amount of time he had. Along with the body he would have to dump Suzanne's clothes and belongings. Trainers, blue jeans, red fleece and a blue jacket. Brown handbag and the contents of the handbag which probably contained a mobile phone, keys,a purse and coins. These items are metal or contain metal. Parts of the trainers, the zips on the jeans and fleece and jacket, the handbag and purse, keys, the mobile phone and the coins all contain metal. So all thats required is get to the track and walk the 2.4 mile track with a metal detector to where the track leads off to the treeline. This treeline must be accessible by car and the route to the treeline must be rugged enough to cause car suspension damage. Then walk into the trees with a metal detector and hope for a signal. And you can see the vegetation on the photos you posted. What's the chances of being able to search every square foot of that effectively? Good point about his suit and not wanting to get dirty though. Unless a dirty track suit was what he wanted the bin bags for. Considering he had all night to plan what to do. Should be in a wooded area to achieve maximum cover and an area where a car would not be visible from the track. Avoid areas which could cause a car to get stuck in mud/marshland. Should be an area off the track from which a car's suspension can be broken by driving over solid rocky/rough terrain towards the treeline. If any areas on the track satisfy these criteria they warrant a closer look. I have decided to go tomorrow Sunday 11th September as I will have more time than I would next Friday. I intend to spend about 8 hours there. At worst its a day out in the fresh air of Lochgoilhead. At best I might find the black bags or the actual body disposal site. Looks set to be dry and fairly warm, even if a bit cloudy. As you say, a really nice day out even if you don't find anything useful. And it lets you get a read feel for the terrain that you can't get from photographs or maps or aerial views. The 2.4 mile (all uphill) forest track road from Pole Cottage is in my opinion not the disposal site as Gilroy would be visible from the track whilst unloading, too risky. I passed a couple of hikers on the way down . This is at least a 5 miles long forest track which ends near the Ardroy Outdoor Education Centre. I didn't investigate as it is probably popular with hikers and I didn't have the time or inclination after my previous 4.8 mile hike. Moving on further north west on the B839 towards the A815 to the gate in Rolfe's map posted on 29th August 09.30pm, where the 222m is indicated. On closer inspection the gate chain (unlike the gate opposite) has been broken twice. On one break the chain link has been joined back together with a black cable tie and the other has not been joined so there is easy access to the forest road. The track (again all uphill) has a few potential disposal sites deep in the trees and vegetation but nothing I could see from the track. A police search in amongst the trees would be useful, it is a massive search area. 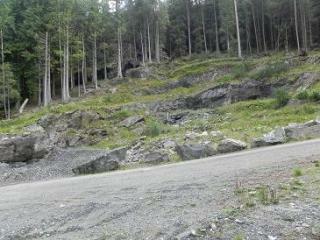 Another point of interest is the clearance of the forest 200 metres further on from the gate towards the A815. When and if this clearance gets to the area beyond the unlocked gate then the forestry workers may find the disposal site. I will upload my photos asap. Glad you had a good day, looking forward to the photos. There is a gate both sides of the road there, and either leads to a promising area. Two chances, and he only had to get one unlocked, and you say one isn't secure. Though there would be some concern that if he disturbed however the gate was fastned, someone might notice and alert the police to the fact that access had been gained. If I'd been him, that's the area I'd probably have gone for, just from the map. But if he had access to a map it must have been on paper because he couldn't risk leaving evidence on his computer that he'd been looking at that. Also, to get that level of detail on the OS map you have to pay money and unless he was already a subscriber it would have looked damn odd if he'd taken out a subscription to the OS the night after Suzanne disappeared. You're right about the forest clearance. It's all dynamic but I think there's a rotation cycle of about 40 years. I wonder if he was thinking clearly enough to choose a relatively young plantation? You know, if he knew that a chain had been joined by a cable tie, that's a gift. Always supposing you have access to unused black cable ties and I have a handful in my kitchen. I wonder how common that is? You could just cut the tie, open the gate, do whatever you liked, and then put the new tie on to make everything look as it was. But would he have known? Is that the area the police said he was familiar with? Is it the sort of thing you notice? And it was all six years ago so things now might not be as they were then. Last edited by Rolfe; 11th September 2016 at 12:53 PM.